Happy Columbus Day, that is, if you are here in the US. Hopefully you are luckier than I am and have today off. Unfortunately, it’s a holiday the company I work for doesn’t really observe. But nonetheless, I do enjoy that the office is somewhat quiet today, it means I won’t have many interruptions writing this blog post. So, lets get right to the post, Powers Gold Label 12 Year-Old Special Reserve. 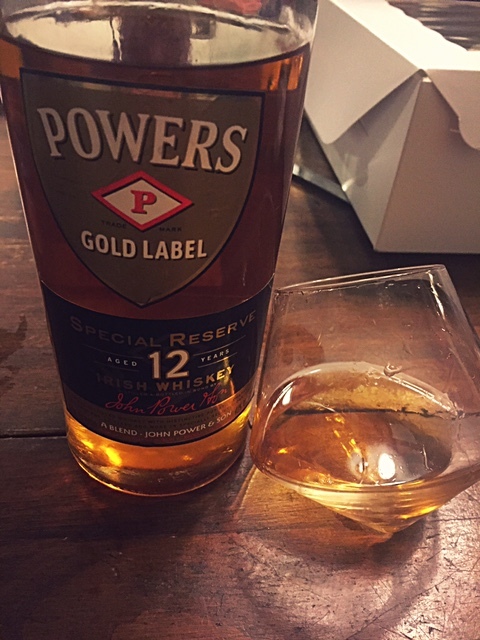 The first time I ever had the original Powers Gold Label Irish whiskey (click link to read blog post) I was extremely impressed. For the price, you get a quality and great tasting whiskey, which to me is a win-win. This 12 year-old is essentially an aged version of that original Gold Label. The tasting notes are bolder, spicier and a bottle will cost you more, as it averages about $40-$44. Depending on where you buy, it’s about double the cost of the Gold Label. I too was very impressed with the 12 year-old but, I will say that if you are on a budget and were unsure of which of these two to get, I would hands down go for the original Gold Label. For me personally, even if I weren’t on a budget I would still grab the original Gold Label. Don’t get me wrong, I did enjoy and liked the 12 year-old Special Reserve, I just liked the original a bit more. The original is crisper and yes, to me smoother. The notes weren’t as bold but they were harmoniously balanced. It lends itself to an every day whiskey. Now on the other hand, if you are looking for something bolder and a bit heavier then the 12 year-old is the bottle I would recommend. Honestly, you can’t go wrong with either the original or the 12 year-old, in the end it all really depends on what you are looking to get. I would recommend trying both.